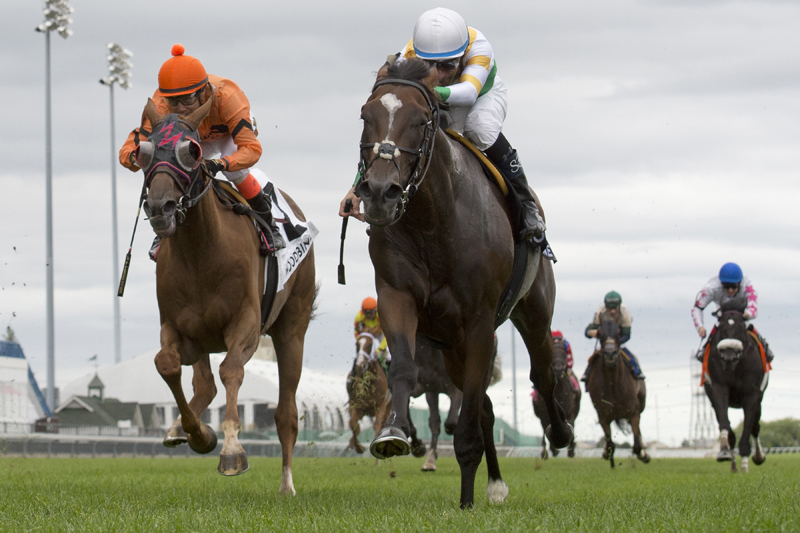 Chiefswood Stable’s homebred Tiz a Slam lasted on the lead in the $175,000 Nijinsky Stakes (Grade 2) to score his second straight graded stakes win on Sunday afternoon at Woodbine Racetrack. Overlooked at odds of 10-1, Tiz a Slam followed up his Grade 3 Dominion Day Stakes victory over 1-1/4 miles on the Tapeta with another front-end effort in the Nijinsky, leading for 1-1/2 miles on the turf in 2:29.06. With jockey Steven Bahen aboard, the Roger Attfield trainee set fractions of :25.85, :51.97, 1:17.19, 1:42.23 and 2:05.83 along the way while turning back challenger Bangkok. The season-debuting European Group 1 stakes winner Mekhtaal rallied late to snag the runner-up role just ahead of Johnny Bear, who won last year’s Grade 1 Northern Dancer Turf Stakes. The winner’s stablemate, Final Copy, finished fourth. Bred in Ontario by the 2017 Sovereign Award-winning owner Chiefswood Stable, the four-year-old Tiznow-Flaming Rose colt boasts wins in one-third of his 18 career starts and more than $800,000 in earnings. He also won the Cup and Saucer Stakes at age two and the Grade 3 Ontario Derby last year. Tiz a Slam paid $22.70, $10.60 and $7.50. He combined with second choice Mekhtaal ($6.60, $4.60) for a 6-4 exacta worth $119.90. Johnny Bear ($4.60) completed the 6-4-2 trifecta, which paid $292.80 for a $1 ticket. With Final Copy finishing fourth, a $1 superfecta of 6-4-2-1 returned $1,041.90. Seeking Albert, Bangkok, Pumpkin Rumble and 8-5 favourite Vettori Kin completed the order of finish.